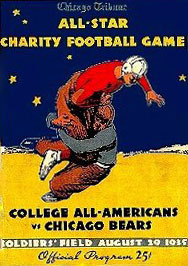 In 1935, after leading his team to a Rose Bowl victory over Stanford, Alabama coach Frank Thomas was tapped to be head coach for the Chicago Charities College All-Star Game. The contest was the brainchild of Chicago Tribune Sports editor Arch Ward and it had been inaugurated the year prior. It was a pre-season contest that featured a team of college standouts against the National Football League champion from the previous season. Voting to select the coaches for the college team was heavily contested with more than 7 million ballots were cast. Thomas garnered almost 2.5 million. By contrast, only 737,000 people voted in the poll to determine the players on the roster. 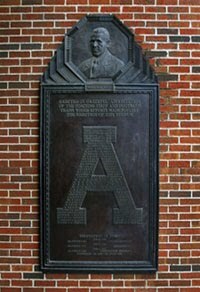 In August of 1935 Thomas travelled with Alabama's standout halfback Dixie Howell to Chicago to prepare for the game at Northwestern University. The opponent would be George Halas's Chicago Bears who had finished runners up for the NFL championship they year before. On the second day of camp, Thomas was hospitalized with what was diagnosed with "acute arthritis" but was most likely a bout with the symptoms from his chronic high blood pressure. He continued to handle the coaching duties despite being confined to a hospital bed for the next week. Thomas returned to the sidelines for the second week of the team's preparations and the game itself. The game was held on August 29, 1935 at Chicago's Soldier's Field in front of 77,450 customers who were drenched by a second-half downpour. The Bears bested the All-Stars in a 5-0 slog of a game that defied Thomas' plan of battle. "It was that damned rain," Thomas said. "It turned what started out to be a great wide open game into a battle where the style was cramped."